Four Belz Hasidim become lawyers with encouragement of Belzer Rebbe; 'Jerusalem Faction' attacks: 'Academic apostasy has ruined many'. Dozens of haredim participated last week in the Ono Academic College campus graduation ceremony. 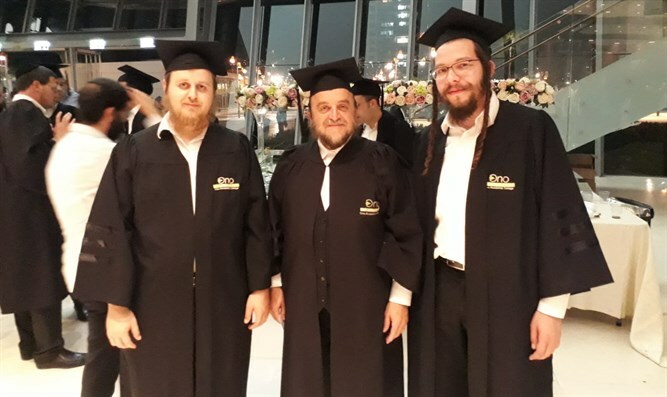 The ceremony was held at the Performing Arts Center in Ashdod, where graduates were awarded diplomas, including four Belz hassidim from Ashdod who were certified as lawyers. Later, pictures of the four hasidim with the traditional lawyers' cloak were distributed. The sight aroused loathing among members of the "Jerusalem Faction" and some Meah She'arim residents who bitterly attacked the Belz hasidim for what they call "academic apostasy (shmad)". "Appalling! The heretical picture that's shaking the Jewish world! ", one wrote. "Four Belz Hasidim at a ceremony for awarding academic degrees to the wretched haredi fallen in Ono Academic College. During the ceremony the fallen wore a uniform reminiscent of Christian priests - a black robe and a black four-cornered hat. "For the occasion, four Belz chassidim proudly took part in the ceremony, whose beards and sidelocks and even the hasidic shoes and special socks attested to their hasidic affiliation, but the Samet hat and jacket with the gartel that Belzers don't remove for a moment throughout the day, they traded for disgusting garments and were smilingly photographed at the conversion ceremony, G-d forbid, as they hold the academic certificate, with a secular student from the academy standing among them. "In the Jewish world the images aroused tremendous shock and great pain, despite the fact that from time to time pictures of haredi Jews from all communities and circles are published participating in these gentile ceremonies. But the combination of the blatant Belzer look together with the contemptible academic uniform worn by those fallen who dared to publish their shameful picture and lower everyone's morale just shows the rift and decay taking place in communities and circles within the haredi public." The writers criticized the Belzer Rebbe for allowing the new lawyers to go to the college. "Two of those fallen opened a law firm in the summer and the ceremony was attended by senior Belz rabbis, who had previously received the Rebbe's blessing. It should be noted that at the inauguration of their office they appeared in full hasidic garb, including the famous Belzer gartel, under which they hide the deep rot they absorbed in college and academia."